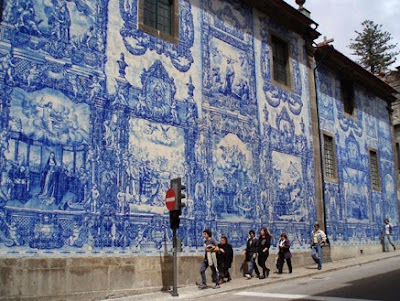 First the interesting - a number pointed out that Portugal has many blue and white ceramic tiled images. 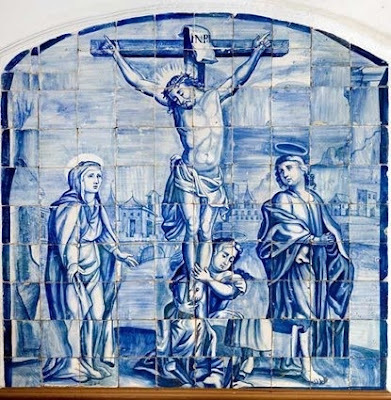 You can see many of these if you do an image search on 'Portuguese religious tile murals'. There are charming little decorative details as well. Remember that these patterns reflect a geometry that echoes the mathematical description of the beauty of the cosmos. When we get this right it is decoration with purpose - subtly but powerfully raising people's spirits to God through cosmic beauty so that they might be receptive to the Word. So there are ways we can start to think about this. It can be done well or badly - we still need to take care that we don't put this together to create kitsch, but as long as we are aware of that we have a chance. And as GKC said - if something is worth doing, it's worth doing badly! We finish with something done well. A cloister in the cathedral at Porto, Portugal. "Geometric pattern is the abstract art of Christianity." We tend to think of abstract as something that has come about only within the last one hundred years. But liturgical artists have had their own form of abstract art for nearly two thousand years. 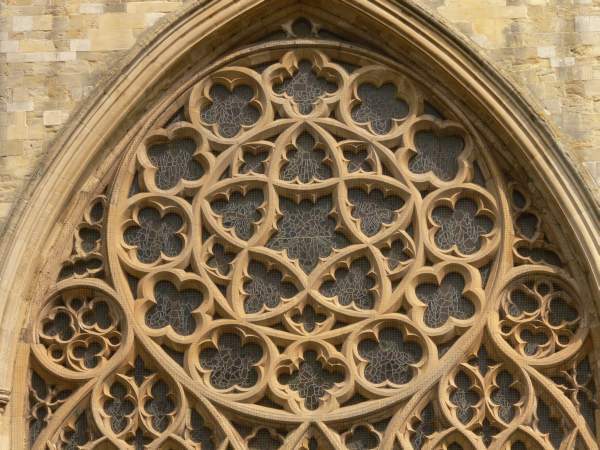 Geometric pattern is the abstract art of Christianity. God made all of creation, visible and invisible, to teach us about Himself. When we perceive the order and pattern that is inherent in creation, the numbers that underlie all of creation, we see the thumbprint of God. 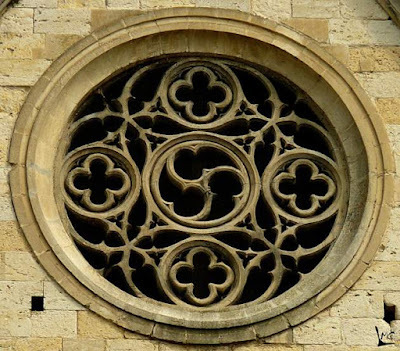 Geometrical forms, built up from mathematical (numerical) forms, are a symbolic expression of Christian Truth. They represent the thoughts of God. A carton of a dozen eggs, for example, holds a quantity of 12 eggs. But the number 12 also has a symbolic meaning. it may represent the 12 tribes of Israel, the 12 apostles, 12 signs of the zodiac, or 12 months of the year. Which of these symbols the number represents will depend on the context in which it is used. In the context of a work of sacred art, depending on the other elements of the work, 12 eggs could represent the New Covenant, a new Church emerging from the "sealed tomb" of the old Law, resting on the foundation of the twelve apostles. But this qualitative and quantitative language of numbers can also be used to construct abstract, i.e. non-representational, patterns that can lead us to contemplate heavenly things. Medieval manuscript paintings often have a geometric pattern serving as the background as a symbol of the order of heaven. 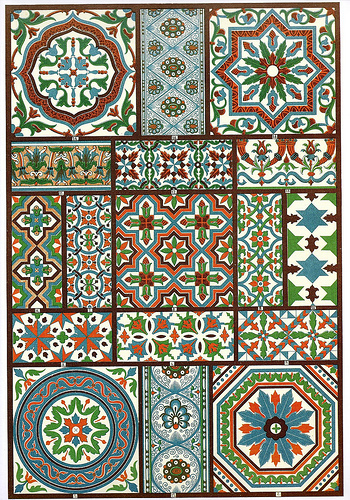 The work above is a design for a church floor, completed as part of the Masters of Sacred arts program at Pontifex University. It incorporates a specific type of scrolling pattern known as a guilloche. This is a meditation on Christ in the form of a geometric pattern. Down the middle axis of the design are three shapes. The first shape at the top contains the symbol for "alpha," the first letter of the Greek Alphabet, The bottom shape holds the symbol for "omega," the last letter. Alpha and omega, the first and the last, the beginning and the end, come together in the middle in a "Christogram" a symbol representing Christ. Jesus Christ is the alpha and the omega, the first and the last, the beginning and the end. Christ is the mediator between man and God. In the ancient world, the number "2" was a mediator between the numbers 1 and 3. The number "2" then, represented a mediation between two extremes, heaven and earth, divine and human, God and man. We might also say then that Jesus, the second person of the Holy Trinity, mediates between God the Father and God the Holy Spirit. Flowing around these central shapes is a bough of laurel leaves in a guilloche pattern. Laurel leaves are a symbol of victory, Christ is victorious over sin and death. The laurel bough weaves around eight medallions which contain another type of Christogram, in this case a cross and the letters INRI. They serve to remind us that Christ obtained His victory through death on a cross, a death at which He was proclaimed Jesus of Nazareth, King of the Jews. And "eight" medallions also have a hidden meaning. Eight is the number of the victorious resurrected Christ and a redeemed world. Eight is the sum of "7" the number of totality and completion, and the number "1," representing the singularity of God. The number "8" is used in baptismal fonts as a symbol of a new life brought from darkness into light. The victorious Christ is the eight day, heralding a new birth and a new creation. He brings the world from darkness into light. There is no reason we cannot imbue the design of our churches with such geometric patterns and symbols that hold a rich symbolic language revealing the truths of the invisible world that are hidden within the visible. All it takes is the knowledge, and the will. It is important to awaken our innate sense of the symbolism of the natural world and all that is created as this stimulates also our natural sense of the divine. The awe and wonder that we feel when we contemplate the world around us is, for all that it seems profound, little better than a shallow emotion generated artificially by a drug if we stop there and do not allow it to draw us closer to its source - God. This is its true consummation, we are made to see the glory of God in his creation and it will be to his greater glory and our greater joy if we allow the beauty of the world to take us to what it points to. We can consider this to be a form of relation. Creation is in relation to its Creator. By virtue of its existence, it is relational, for it is connected to its Creator by the mark of divine beauty He has impressed upon it. This interconnectivity of all that exists, therefore, is not a mental construct thrust upon the cosmos artificially by mankind. Rather it is a property of the object that we see. All being is relational by nature and is patterned lattice that has the Creator at its heart. As created beings ourselves, we participate in this dynamic too, seeing a natural connection between ourselves and the rest of the cosmos. All of mankind is endowed by the Creator with an intellect and the capacity to observe the world around us in such as way that it can derive from it an understanding of our place within it, and ultimately this points to and sheds light on our relationship with the Creator. Part of our task as people seeking to evangelize the world is to re-awaken the final link in the chain of connection between creation and Creator by re-establishing a culture that is rooted in this principle of interconnectivity through its beauty. This process of evangelization of the culture begins in the church in which all that we perceive and all that we do participates in this language of symbol and is there to connect us to God. 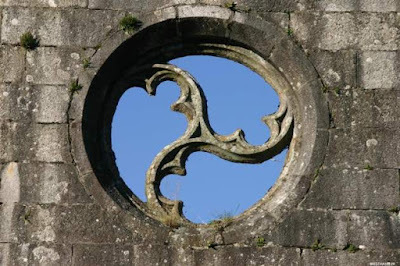 Coming back to the symbolism of number, it is widely accepted, even in the secular culture, that the natural world is connected to mathematics. The connection is so strong that few, if any, doubt, for example, the power of mathematics to help the natural scientist to describe the processes of the natural world. However, I think we should stop for a moment and think about this - it need not automatically be the case. Once I realised this it became a source of great wonder to me that the abstract world of mathematics is so intimately bound in its structure with the behaviour of the natural world. This had to be noticed before the connection could be made, and it is why figures such as Boethius commented, in his De Institutione Arithmetica, (Bk1, Ch.2) that 'number was the principal exemplar in the in the mind of the Creator' and from this is derived the pattern of its existence that the scientist observes. The natural scientist of today is generally less aware of the symbolism that runs through both nature and mathematics. The medieval thinker would not have rejected method of today's natural scientists I suggest but would have added to his description of the natural world the symbolic language of number, which is largely forgotten today. If scientists were to do this today, I suggest that it would inform his work in such as way that technology would both enhance his work as a conventional scientist and allow its applications to become more in harmony with the flourishing of man. Rather than being in conflict with today's scientist, the proponent of sacred number has something that can help him to be a better scientist. Geometry is a way in which number can be expressed in space through matter, and so this is why geometric patterned art ought to be right at the heart of the evangelization of the culture and any sacred art. It is also why the study of the symbolic meaning of number in conjunction with the study of geometry is so important in a Catholic education today. What I propose is a study of geometry that is so much deeper, and more exciting than the dull task of memorizing Euclidian proofs (which sadly seems to be the way it is taught in Great Books schools today). This is about connecting the pattern of the universe to the creative impulse of man so that the beauty of the culture can direct us to God even more powerfully than the most beautiful sunset you have ever seen. And so this is why I would like to see the rebirth of the Rose Window, in our new churches. This is more than simple decoration, if done well it has the power to stimulate in us a profound sense of our place in the world and in relation to God. Always assuming that even if we got as far as seeing them in churches, the catechesis available would be minimal or poor (we're Catholics!) these would need to be designed in such a way that the symbolism was obvious. There is nothing stopping words and scriptural quotes being added, just as we must in figurative art, in order to clarify, for example. 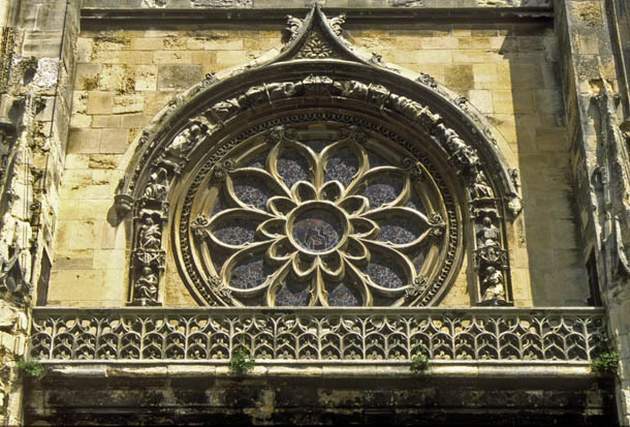 Here I give some examples of such windows with, three, four, five and sevenfold symmetry. I have obtained these photographs from a great resource that I discovered online called therosewindow.com, run by Painton Cowen, who kindly gave us permission to reproduce his photographs here. This site has photos of windows based upon numbers that you don't normally associate with Christian symbolism - 11 and 13 for example. I would want to consider carefully the basis of these before replicating them today. We must learn from the past, but we must be aware also that not everything that it tells us is true! 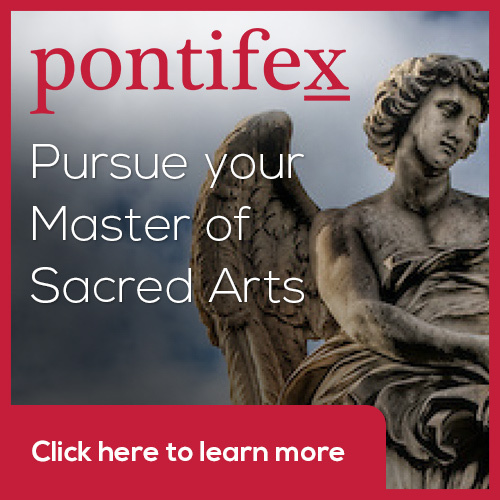 If you want to know more about the symbolism of number and the philosophy behind it, I suggest that you either read The Way of Beauty or take the course, the Mathematics of Beauty which will soon be offered at www.Pontifex.University, Master's in Sacred Arts program. 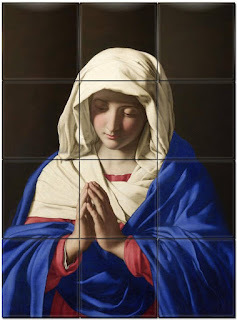 This is one aspect of art that was just as bad in those days as it is now, perhaps even worse...I bring this curiosity to you courtesy of Deacon Paul Iacono of the Fra Angelico Institute of Sacred Arts. He, in turn, drew on reports that appear in the Guardian newspaper, here. As part of a systematic study of graffiti in Churches in East Anglia they have found some signed by a writer and monk John Lydgate (an admirer and friend of Chaucer). What strikes me about all of these is how timeless the images are. Graffiti, it seems was just a bad (or good, depending on how you look at it) in the 14th century as it is now! To the left you have a bishop in mitre. Below is an inscription found in St Mary's church, Lidgate, Suffolk. The text on the pillar, a few millimetres high, translates from the Latin as 'John Lydgate made this on the day of St Simon and St Jude'. That feast day is 28 October, with the year some time between 1390 and 1450. Underneath that is the church where the inscription was found. Other examples include devils or dragons and even geometric patterns. Given the great interest in these, it does make one wonder if the past whitewashing of graffiti in the New York subway might be seen as a destructive act of iconoclasm by future commentators! 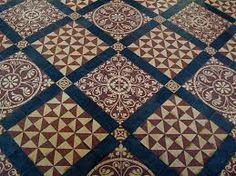 Some readers will already be aware of the Christian tradition of geometric and patterned art (see longer articles in the section Liturgy, Number, Proportion on the archive site). This was an adaptation of the patterned geometric art that we see in the pre-Christian classical period. TMC is, in a small way. 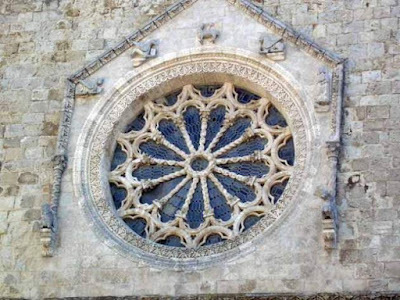 The Way of Beauty class, students reproduce some of the patterns seen at the Romanesque Cappella Palatina in Sicily.The principles behind this geometric design echo the patterns and harmonies that are the basis of proportion and compositional design in traditional architecture and art (and they are surprisingly simple to learn – you do not need special artistic ability). Although all artists would benefit from this knowledge, this is not simply an artistic pursuit. It relates to the study of the traditional education called the ‘quadrivium’. The quadrivium, four of the seven liberal arts (geometry, music, number and cosmology), is concerned with the study of cosmic order as a principle of beauty, and which is expressed mathematically. The patterns and rhythms of the liturgy of the Church reflect this order too. Christian geometric art is an abstract (in the sense of non-figurative visual representation) manifestation of Christian number symbolism. This aspect of traditional education came from the ancients too. Pope Benedict XVI, again in one of his weekly papal addresses, described how St Boethius worked to bring this aspect of Greco-Roman culture into a Christian form of education, by writing manuals on each of these disciplines. In the medieval university, he seven liberal arts were the basis of qualification of the Bachelor of Arts (the Trivium), the Master of Arts (for the Quadrivium) and these then were the preparation for further study in the higher subjects of Theology or Philosophy, for which one could receive a Doctorate. Geometry is not now, to my knowledge, a living tradition as a Christian art form. By the time of the Enlightenment the acceptance of number symbolism had fallen away and it died out. I recently taught an undergraduate class about Islamic geometric patterned art at Thomas More College. 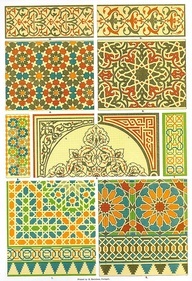 This tradition, an example from a tile at the the Alhambra in Granada is shown right, is derived from the Byzantine patterned art of the lands they conquered (and of course the classical mosaics and other patterned art that preceded them). Because Islam was forbidden completely, in its strictest interpretation, from any figurative art, their focus on abstract art forms was intensified. Islamic craftsmen took what they had taken from the Byzantine craftsmen and developed it into something more complex than had previously existed. The question I asked that first class was: can we safely take it back? That is, in order to reestablish this as a Christian form, can we look to the Islamic art form and re-form it into Christian tradition again? I was pleased that in response my class said, yes. (Teachers are always pleased when their class agrees with them!) They understood further that while we can adopt some of the forms, we don’t have to adopt the Islamic numerical symbolism as well. Islamic number symbolism is similar, but crucially different from the Christian symbolism. (The number three and the Trinity come to mind immediately.) 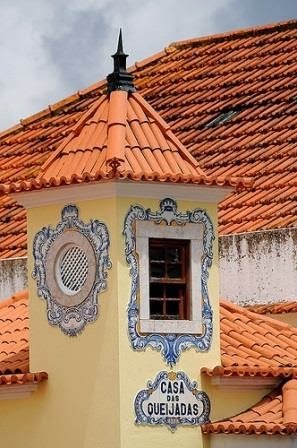 That is, it is always important to make sure that due proportion is used – that the number symbolism contained within the symmetry of the pattern is appropriate to the place where it is used, when understood in Christian terms. The day after introducing the topic to the TMC students, I stumbled across this website, www.thejoyofshards.co.uk which is a great resource of images of mosaics and opus sectile work. Its gallery ranges from the floors in the offices of a Victorian architect in Norwich to Roman villas and the great churches of the world. 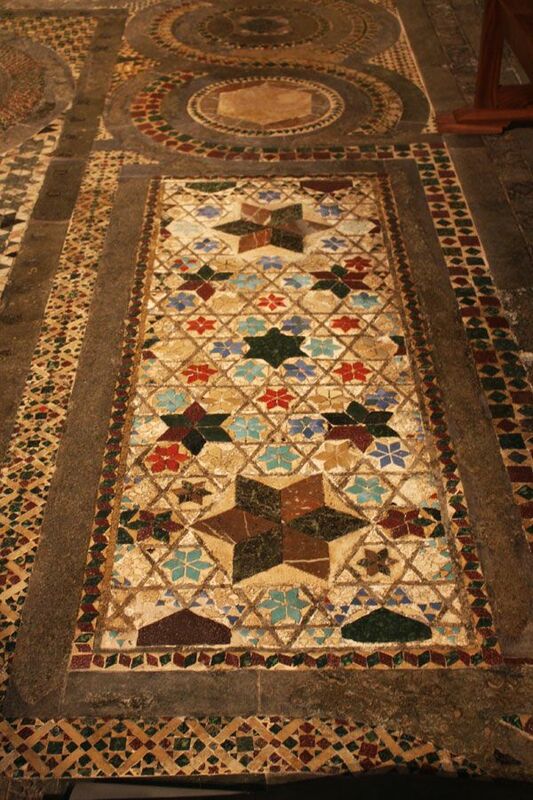 The section on Sicilian mosaics has 80 photographs of the Palatine Chapel in Palermo. This revealed that precisely what my class was proposing had been done by the Norman king, Roger II of Sicily when he built his private chapel in the 12th century. He employed not only Christian mosaicists and Cosmati pavement specialists who produced geometric art in the Christian tradition, but also Islamic craftsmen. He instructed them to produce patterns obviously derived from those that can be seen in mosques and adapted for Christian use. This a model that would be well worth further study and I hope any architects reading this might consider commissioning something like this. I have included some photographs below of the chapel, and one pattern from a mosque for comparison; and you can see more at joyofshards.co.uk. Last week I featured the first work produced by my students at Thomas More College of Liberal Arts in their sacred geometry class. They did eight sided figures based upon an Islamic design. Just in case anyone has been wondering if this is an over adventurous pushing back the envelope of what appropriate in the context of sacred illumination, I thought that it would be interesting to show these images that I discovered on the British Library website (which is wonderful resource for images of ancient manuscripts). These are from a 14th century Palestinian gospel of St Luke. I have no additional information as to why this particular design was chosen. 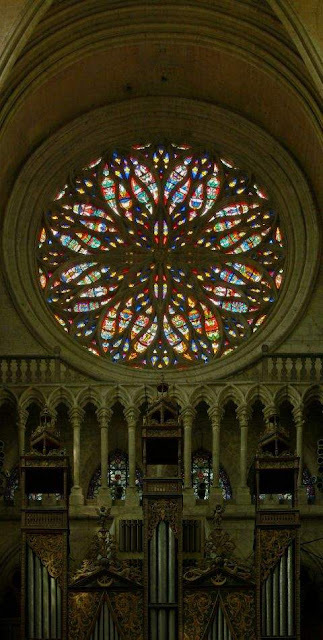 All I can say is that I would have been very happy to see this in my bible because of the four-fold and eight-fold symmetry that exists in this. Four symbolises the world and four gospels were chosen by the Church so that the Word was carried to the four corners of the world by the four evangelists, each evangelists is symbolised by the four figures described as sitting around the throne of Christ in the book of the Apocalypse. Regular readers will be familiar also with the symbolism of eight: it corresponds to the eighth day of Creation that ushers in the new covenant: the incarnation, death, resurrection of Christ. Sunday is the eighth day of the week. In the basic repeat unit, which is repeated like floor tiles, we have, geometrically portrayed, four versions of the Word in the gospels (four small octagons) spinning out of one large one, the Creator himself, enthroned and in glory. Pictorially, this would be Christ in Majesty surrounded by the Angel, the Lion, the Ox, and the Eagle. When you have four of the repeat units combined, there is long-range order which has a fourfold symmetry in which four large octagons surround the central, which is the broad design of this 'carpet page'. There is a beautiful harmony to this, and it seems to me to reinforce the superabundant truth of Eucharist: that through the propagation of his gospel in a literary description of his life, Christ in Majesty is really made present in the world in the liturgy of His Holy Church. I repeat, this is my personal reaction to this design, a meditation upon what I am seeing, so I could be reading more into this than the artist intended. However, as an artist, I would happily reproduce this design with the intention of incorporating this symbolism into my work. There is such a beautiful harmony to it, it seems. Images: below the images of the 14th century gospel, I have given the Thomas More College, Christ in Majesty to illustrate the point, painted by myself. Here are some examples of geometric art produced by students from Thomas More College of Liberal Arts. They are their first projects for my Way of Beauty class. They were asked to produce an octagonal tile pattern that was based on a traditional Islamic design. I asked them to design the corners and the border and decide on the colour scheme. I encouraged them to use as few colours as possible, using only what was required to give contrast and allow clarity of design. I also insisted on the shape being described by a continuous piece of tape which wove an over under pattern. The colouring was deliberately muted and downplayed as this allows for less clashes of colour. On the whole, I prefer to use natural, earth colours for the same reason. These are difficult to get in the sort of coloured pencil sets that most of our students have, which tend to have very bright, artificial looking colours. If they used these alone then the result would look something like a bad record cover from the 1960s. This might have sold music in 1967, but it won't cut it in traditional design (if only our liturgy musician realised that the same is true for the style of folk music of period)...anyway, back to these design. To try to eliminate the impression of psychedelic kitsch, they carefully built up the colour by overlaying it with lightly shaded layers of earth brown and grey pencil. Students are Isabelle Anderson, Theresa Scott and Katherine Blicharz. In assessing these, remember that this is the very first project that I set them. They are intended as exercise before designing a church floor. 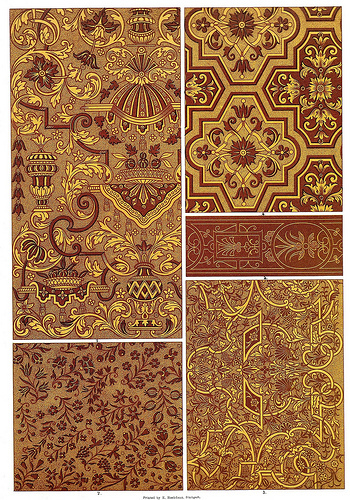 The Treasury of Ornament - Pattern in the Decorative Arts, by Heinrich Dometsch. 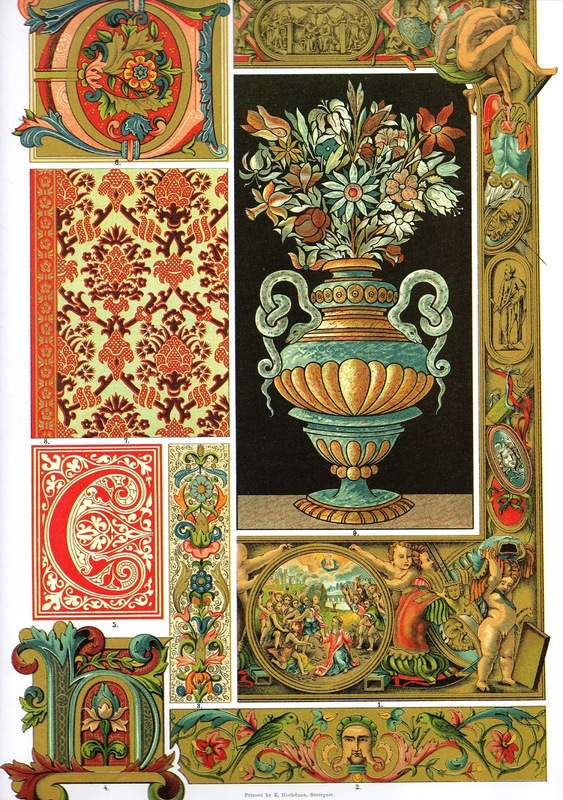 Here is a book worth considering for students of traditional patterned art. The series is the Library of Design and the title is Treasury of Ornament - Pattern in the Decorative Arts by Heinrich Dolmetsch. This and a number of similar books by the author are available here. I came to it by way of one of the freshman students at Thomas More College, Meg Berger, who has a personal interest in these traditions. It is a recent publication of a book first produced around the turn of the last century in Germany, the first English edition coming out in 1908. Each plate is an arrangement of up to 15 or so different patterns from different original sources in each classification discussed. He covers both 'hard' geometric patterns and 'soft', more calligraphic forms in ancient non-Christian and Christian traditions, East and West. Particular examples are numerous plates in each category of Egyptian, Greek, Roman, Chinese, Japanese, Arabian, Turkish, Persian and Indian. 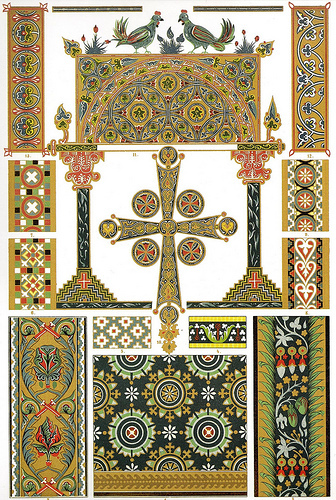 Two thirds of 85 plates are Christian covering Celtic, Western 'medieval', Byzantine, and Renaissance styles. This will be of interest, I think, to those who are seeking to re-establish (or perhaps one might say at the very least reinvigourate) the Christian tradition of geometric and patterned art. While one does not want to look exclusively at Christian traditions now any more than those who formed these traditions in the first place did, one must look discerningly at the art of non-Christian cultures. The principle of universality is very important in this process of discernment. (though not the only one). The task, therefore in studying the art of other cultures is to try to separate out the universal qualities from the parochial. This is not absolutely straightforward. We might look for visual elements that are common to all of course. That is helpful, but also restricting because as every general principle is manifested through the creation of a particular example it might cut out some forms that are worthy of consideration even though unique.That is because principles are unchanging, but their application is not. We might have two distinct forms that neverthless participate fully in one governing principle. In other words the idea behind two things that look quite different, might be the same. It is that idea that we are trying to discern. A way of looking at universality was described to me recently by Thomas More College's Composer i Residence, Paul Jernberg. As a composer he is always trying to create new applications of the general principles that define sacred music. He talks of particular forms, with plainchant being the best exemplar, that might characterise a time and place, but nevertheless are accessible to people who are not from either. Universality, is therefore, another way of describing this noble accessibility. In the context of art, a lot of this will be a judgement call on the part of the artists. We cannot always define precisely what it is we are looking for, but that does not mean we should not try. If we ask the question, at least, will this appeal across different cultures, then we are more likely to get a satisfactory result. 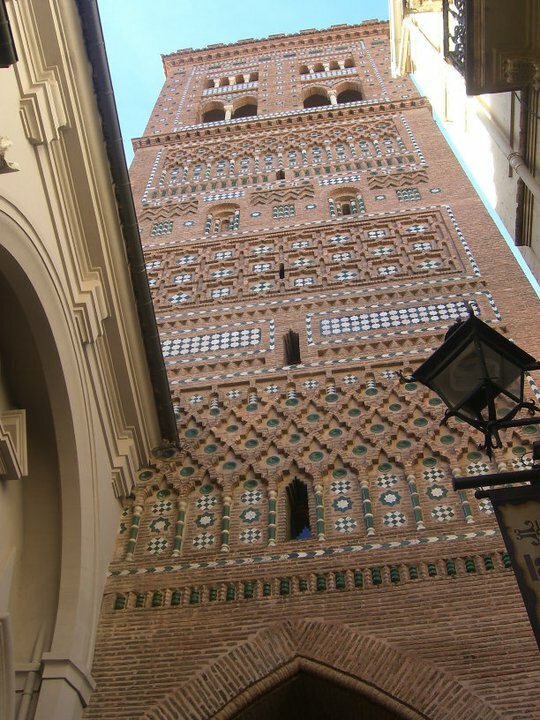 The images below are, from the top: Byzantine, Chinese, French Renaissance, Italian Renaissance, Arabic-Moorish, and Italian Renaissance pottery. Here are some pictures of 13th century tiles from Cleeve Abbey in England. 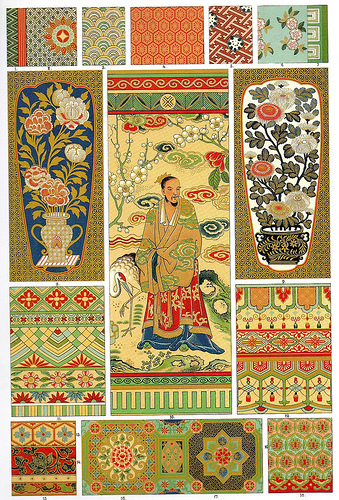 They are a combination of geometric and pictorial designs. The latter employing heraldic and literary themes rather than scriptural. 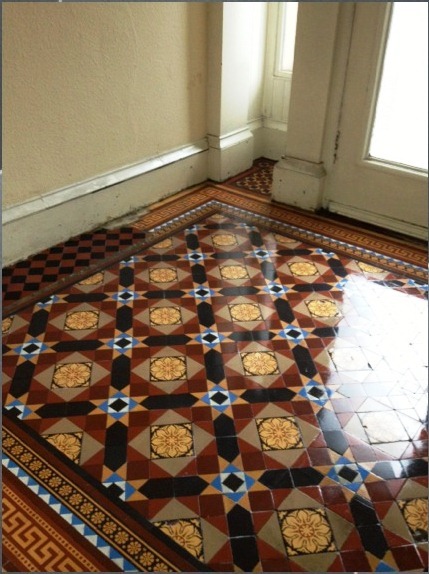 The form will be familiar to some through the Victorian neo-gothic tiles that are more common today, and which were based on designs from this period. I am admirer of the later forms as well, incidentally. 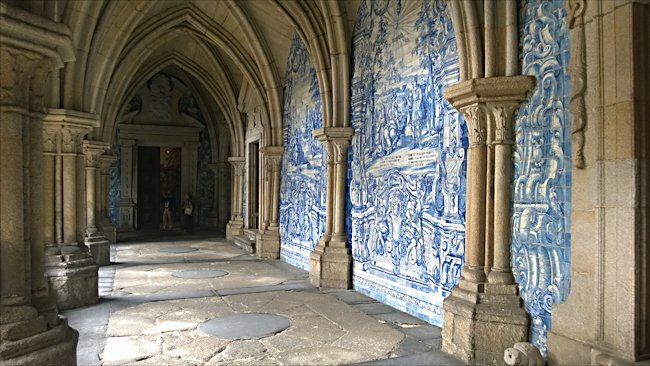 I view as an authentic re-establishment of a past tradition and worth looking at not only for the architecture and tiles of the period, but also as case study on how to look to the past in a constructive way. 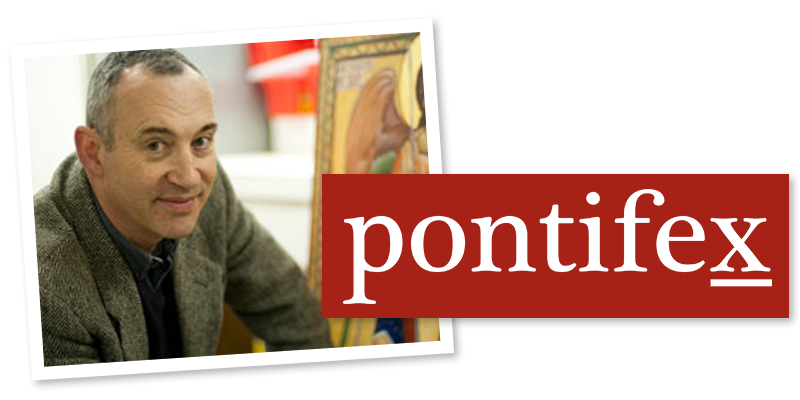 Thanks to Deacon Iacono of the Fra Angelico Institute of Sacred Art who brought them to my attention by referring me to an historical account given in the L'Historien Errant blog. Above: the abbey church floor; and below: the refectory floor. The others are details of the refectory.